When it comes to large 4-wheel drive vehicle manufacturers, there’s one car make that pops into your mind – Nissan. This car make produces one of the most popular 4×4 vehicle models that hit the car market in Australia and New Zealand, Caribbean, Europe, Japan, Middle East, Africa, and Latin America. You’re probably familiar with the Nissan Patrol, right? This car model is considered a total utilitarian and tough vehicle – it is huge, functional, and built to last. Through its series of models, Nissan has proved that a 4×4 vehicle has a lot of rooms for outstanding improvements. That is why this review is going to tackle about the 2013 model of Nissan Patrol. If you already own this ride or are planning to purchase and are just looking for an unbiased review about the vehicle, then this article is good for you. By general standards, it is safe to say that this car is bigger. To be specific, it is obviously longer, taller, and wider than its direct competitor, the Toyota Land Cruiser. (Note: Nissan is trying to win Toyota Land Cruiser buyers by coming up with this kind of heavy duty autumobile. It also has accordingly priced its vehicle close to Toyota Land Cruiser. The entry level ST-L sells less than $85,000 while the Ti sells below $95,000 and Ti-L for less than $115,000.) Compared with other Nissan Patrol models, the 2013 is built for a better off-road driving experience–but that is just about it. Anything new that the Nissan Patrol (2013) has is somewhat more impressive. Now, let’s take a look at the seating capacity. This Patrol model can house up to eight people (in the entry level and mid-spec), while it has a seating capacity of up to seven people in the Ti-L grade. That is great if you are a driving with a family of five or more! Not to mention luggage, it is pretty sure that the Nissan Patrol (2013) can store as much luggage because of its large interior. Not only that, if you are going to fold the 2nd and 3rd row seats, the space opens up to an impressive 3107 liters of capacity. Moreover, even if the seats are in the upright position, you will still have a 550-liter of carrying position. Long and short of it, when it comes to load space, the Patrol is pretty much generous. The only catch that might disappoint you is this: the second row of seats doesn’t have a sliding provision. Thankfully, the legroom is still substantial, as well as with the elbow room and the head room, so it’s still great. Aside from the modern masculinity design, this vehicle is also pumped in aesthetic with its fresh and smooth lines. With the Ti-L version, a smart LED signature is crafted on the rear taillights of the vehicle, as well as the Xenon headlamps. However, Nissan decided not to put the daytime running lights on the latest Nissan Patrol (2013) compared to the previous Patrol models. With Nissan’s effort to produce an optimum-performing 4×4 vehicle, this Nissan model offers a lot of functional features. The ride has an 8-way power driver’s seat, a high-technology 7-inch LCD screen, an innovative cruise control, and a astounding dual-zone climate control. Even better, this off-road vehicle has a keyless entry and start. It also has a privacy glass and electrically operated door mirrors that can be folded. 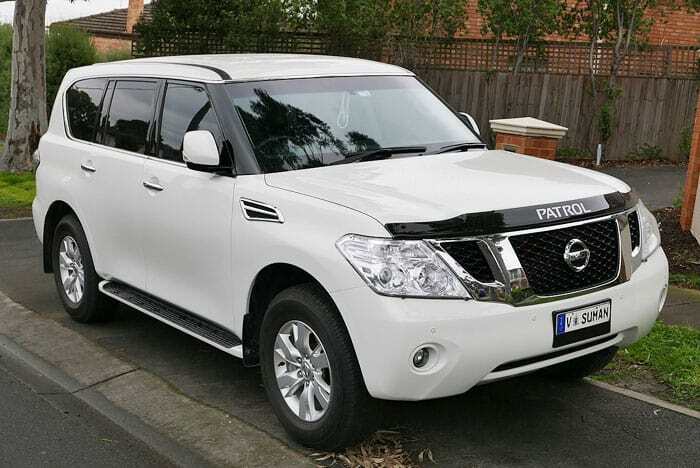 For a large 4×4 vehicle, the Nissan Patrol (2013) is obviously a good catch. As with the Ti model, which is a mid-spec grade, there is an added leather trim inside the vehicle and a 4-way (instead of 8) electrically activated passenger seat. The model is also set-up with rain-sensing wipers, automatic headlights, hi-tech speed sensing power steering, power glass sunroof, and the superior Hydraulic Body Motion Control Suspension system or HBMC. When it comes to exterior parts, this vehicle is equipped with highly engineered 18-inch alloy wheels. The Nissan Patrol (2013) also comes with a full-size spare tires and tough side steps. 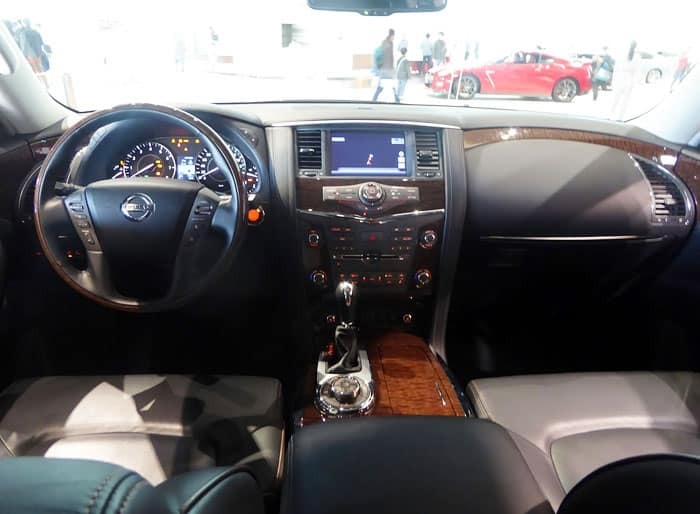 With a similar look with Nissan Infinity, the Patrol has a wood grain trim with a premium look and ambiance. 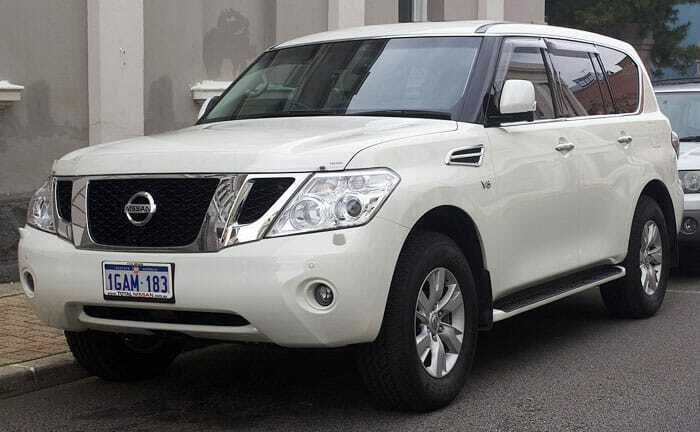 The Ti-L model of Nissan Patrol (2013) nevertheless offers greater features than its inferior versions when it comes to additional technology and luxury add-ons. You will find the creative memory setting equipped for the door mirrors, steering wheels, and even the seats! The vehicle is also built with a cool box, a useful satellite navigation, a rear vision mirror that automatically dims, a music server, a system that monitors tire pressure, a 360-degree view monitor that uses four cameras on a bird’s eye view camera shot, a system that warns the driver for a blind spot, a powered tailgate, and a reliable cruise control. As for the entertainment, the Nissan Patrol (2013) Ti-L model is equipped with 13-speaker audio system (premium-made by Bose), and two 7-inch DVD screens built on the rear seats. In terms of connectivity, the line of Nissan Patrol has an enabled Bluetooth connection through any phone that has the same connection system. You can play music using your iPod through USB connection too. However, with the Ti-L version, you get to stream music via Bluetooth, which is a pretty cool thing. Now, safety features are one of the most important things that a vehicle has to have. This car is equipped with safety gears. Equipped with 6 airbags (full length, curtain), this Patrol model is built not only for experience and engine, but also for safety. This model is also built with brakes with ant-locking system and a modern electronic brake force distribution. There’s also the vehicle dynamic control for a more precise driving and a useful brake assist. When it comes to engine performance, the Nissan Patrol (2013) has a refined v8 engine and has a 7-speed automatic transmission. On the road test, the vehicle’s 5.6 liter engine is astoundingly refined and quiet. If you are the type of driver who is sensitive to the humming sound of a car’s engine, this Patrol will not disappoint you. Your driving experience will be smooth and forward as the engine has an available 500Nm+ of torque from 2500 Revolutions per Minute (rpm). Basically, your driving will be almost effortless and easy. If you prefer manual driving, then here’s good news for you: the Nissan Patrol (2013) can be shifted to manual driving from its equally smooth 7-speed AUTO transmission. Problem about high-speed overtaking? It shouldn’t be a problem with this model because it is manufactured to quickly adjust smoothly from speed to speed as you hit to the throttle (even if you’re going to talk about the Ti-L model, which weighs about 2829 kilograms). Although Nissan claimed that Patrol’s fuel consumption of 14.5 liters per 100 kilometers, you can still travel at a long distance (even off-road) with its standard fuel tank of 140 liters. Cornering using Nissan Patrol can be an obvious problem for you, if you’re going to consider its huge built. But with the help of an incredible Hydraulic Body Motion Control, which is standard on the models Ti and Ti-L, there won’t be any need for anti-roll bars as it impressively minimizes the vehicle’s body roll. If you are using the standard model, which is the ST-L, you will notice an improved handling of the Nissan Patrol on the tarmac because of the changed volume of the hydraulic fluid in each of the vehicle’s shock absorber. Wonder why? All thanks to the system that uses a cross link piping (dual network). This is because Nissan built this automobile not only for off-road driving, but also for world rallying. Pretty cool, eh? In off-road driving, the Hydraulic Body Motion Control is similarly useful as it allows the vehicle to gain better suspension with the absence of anti-roll bars. What’s really great about the Nissan Patrol (2013) is its ability to climb over large bumps or obstacles while giving the passengers and the driver the utmost comfort they can experience. Even better, this vehicle’s 4-wheel drive system is more improved through Nissan’s innovative system called All Mode 4×4. This system shares out the torque to the four wheels when the driving condition goes up to 50% on the front wheels and 100% on the rear wheels. It also has 4 driving modes that you can switch from on-road to sand, rock, and snow. Is it worth it to purchase this car? Definitely yes! With the off-road vehicle’s sleek and shiny exterior design, innovative features equipped inside, and its carefully engineered technology, you’d definitely get your money’s worth. The Nissan Patrol (2013) is not just style, but it is a 4×4 vehicle that offers everything that a driver and a passenger needs when driving. And if you’re a driver with a large family of more than five, this vehicle is just the right thing for you.